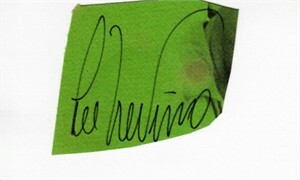 Cut signature autographed in thin black marker on green paper by legendary golfer Lee Trevino, mounted on a 3x5 index card. With certificate of authenticity from AutographsForSale.com. ONLY ONE AVAILABLE FOR SALE.